Minors caught with a small amount of cannabis won't get criminal records. A worker weighs a package of dried marijuana at the Canopy Growth Corporation facility in Smiths Falls, Ont. on January 4, 2018. REGINA — Saskatchewan is proposing to set the legal age to consume cannabis at 19 but minors caught with a small amount won't end up with a criminal record. "It would have been a challenge to use 23 or 25 or a later age. We were afraid that it would make it easier for the black market to be established at the lower ages." 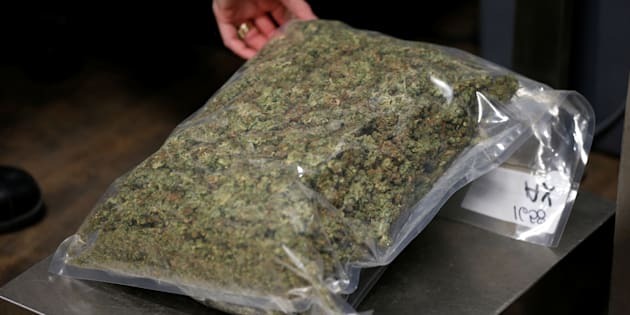 The proposed legislation bans anyone under 19 from possessing marijuana, but getting caught with less than five grams will not result in a criminal record. Rather, Morgan said, the pot would be confiscated and a fine imposed. "We have to recognize that these are young people and we didn't want to be onerous to the point that we imposed a serious criminal record on somebody or something that was disproportionate to the responsibility that a young person should have. It was a balance." It would be a criminal offence, however, for an older person to supply marijuana to a minor, Morgan said. Saskatchewan is also proposing a zero-tolerance policy for drug-impaired drivers and a ban on consuming cannabis in public spaces, including schools and daycares. "Treat it the same way you would open liquor," Morgan said. The province plans to follow federal standards and limit a household to four homegrown plants. Section grower Corey Evans walks between flowering marijuana plants at the Canopy Growth Corporation facility in Smiths Falls, Ont. on January 4, 2018. Gene Makowsky, minister responsible for the Saskatchewan Liquor and Gaming Authority, said a price for cannabis is likely to be suggested by the Crown agency from time to time. That will be a delicate balancing act, he said. "You'll want to find that spot where you want to get rid of the black market, but you don't want to make it so cheap as to ... make it that much more available, particularly to young people," he said. "We don't know at this point what the exact price will be." Makowsky has already said the sale of legal cannabis will be handled by the private sector with government oversight. Some 51 retail cannabis permits are being made available in 32 communities. Retailers will have to pass a "good character" test similar to that required for alcohol sales. Makowsky said retailers will be allowed to purchase cannabis from out-of-province suppliers.